PAPERS …… art …. the muse and more ! if you are interested and want to contribute i would send you my address via email ! The Celestial Windows are open, there are angels everywhere, Mother Goddess is sitting to the right, smiling to herself.. looking out at the Universe. this is the third image for today.. and the last. tomorrow i will continue and – probably – finish it. a new WIP with working title RED. as i read a lot and order books very frequently online – no i do not use kindle! i like BOOKS ! 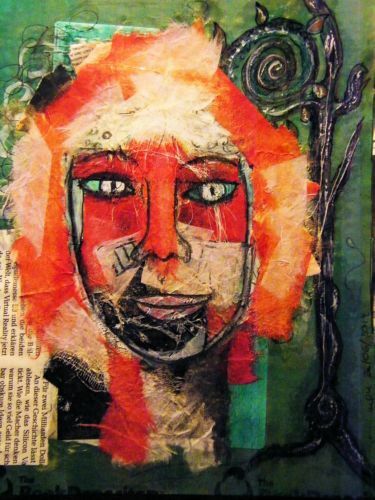 🙂 – i have quite a lot of cardboard which i use for my collages / mixed-media art… so i suppose i could call this recycled art. why red ? red is one of my favourite colours … now this has to dry and i am looking forward to continue with this tomorrow.